Dear 'Jane' Readers, Explain To Us What You See In 'Nylon'? How will you replace Jane? (Or as a newly jobless Jane alum just mused to us, how will Jane replace its jobs? "Do they write about diets now? Do they turn themselves into fashionistas?") Yesterday we took a poll as to your feelings on the matter, and last we checked the vast plurality of you said Nylon. Really? 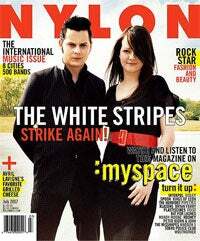 Nylon? We'd never actually read it. Until today! And we must conclude: "meh." The magazine really seems to like MySpace, which makes sense because it's sort of the less-unruly Myspace of paper, in that it might be fun for us if MySpace had not renedered all of hipsterdom (and the world) functionally illiterate already, so instead it reads like a braggy self-consciously dumbed-down menagerie of hipster references set off by pictures of hipster kids in hipster poses and ew there's Leigh from Misshapes. (Do you know who Leigh Lezark of the DJ collective Misshapes is? Did you only know because you read Gawker? We actually knew who Leigh from Misshapes was before she landed herself on Gawker, because we went to her party, "Misshapes," which would have probably been the most forgettable party we had ever in our lives attended if she didn't insist on reminding us of her incredibly substantive and influential existence so often). Anyhow! Onto the magazine. Where a typical sentence in the last issue of Jane goes: "The conversation was our normal patter—cremation versus burial, a friend's recent abortion and the convenience of peeing in the shower," a typical Nylon sentence goes "Stockholm isn't just a music capital — it's also home to some of the most exciting fashion anywhere" — accompanying a fashion spread in which every single model is wearing a T-SHIRT. Berlin! Peter Bjorn & John! A story on Dani Stahl's trip to Seattle to customize Microsoft's "cool new media player" the Zune! A four-page ad spread for Zune! A clothing line called "Illionaire"! In our favorite feature, wherein the magazine attends a party at Cinespace and interviews some attendees, "Sam" is quoted saying he is there "To see Steve [Aoki] and D.J. A.M. spin. So talented." Are you a hipster? the magazine asks. "I don't know. I haven't been defined yet." Well Sam, actually, the Nylon marketing department probably has defined you, and though they're smart enough not to put their media kit online we'd bet they have a douchebaggy corporate term they use to sell the fact you like CocoRosie and wear American Apparel slim slacks as some sort of evidence you are a "tastemaker" to the Microsoft guys. Too bad all those tastemaking classes never taught you to read! *Oh no! Missbehave must have found our poll cause now they're totally winning. Um, we'll hate on them next. Though we actually sort of like them.